Thank you to all who helped make this years field day a great success! 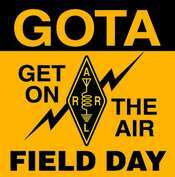 ARRL Field Day is the largest on-the-air operating event in Amateur Radio. bringing new and experienced hams together for a weekend of fun! Major Deegan Expressway 87 NORTH – Exit 2, Yonkers Ave., 2nd traffic light make left onto Yonkers Ave. (West). Go 7 (seven) traffic lights (0.9 mile). After overpass, make right onto Midland Ave. and immediately a quick left onto Cook Ave. Cook Field is on your left at 2nd STOP sign. North Broadway going south. Turn left on Ashburton Ave. Turn left on Yonkers Ave. Turn left on Bennett Ave. Turn left on Cook Ave.
Cross County Pky West. Take the Yonkers Ave. East exit, exit #3. Bear right on Yonkers Ave. Turn left on Bennett Ave. turn left on Cook Ave.